This Amish Mission Leg Table is proudly made in Indiana. Choose to have this Mission table handcrafted in your choice of oak wood, brown maple wood, rustic cherry wood, cherry wood or quarter sawn white oak wood. If you are looking for a custom wood choice, please call one of our Amish furniture specialists because we are happy to create custom furniture for you. This table comes with a Mission top and edge but you can choose from our many edge options as well as a round or oval table top. The arched skirt sets up the 3" square table legs and creates a true work of art! Choose a two-tone finish as shown with painted table legs and a stained table top. Finish samples are available by calling 1-866-272-6773. The table comes standard with a solid top but you can order with to four 12" extensions. If you would like skirts on the extensions the arched skirt can be continued. Please call if you would like self-storing table leaves or a butterfly leaf as these options are available. 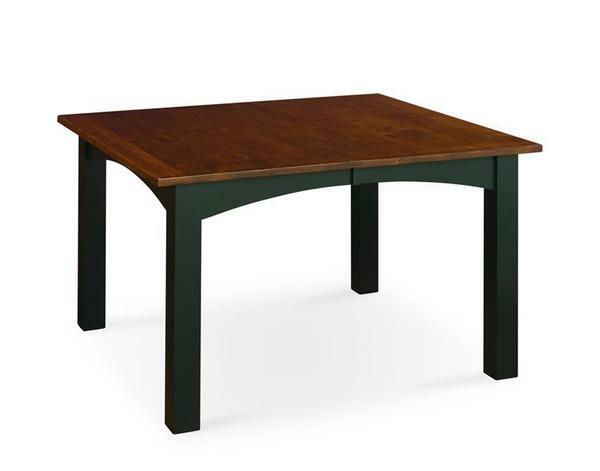 The table comes standard with dining height of 30" but if you are looking to use this Mission table with Mission bar stools or Counter Stools please select the 36" or 42" height. If you would like to read more about the Amish and Mennonites then be sure to check out our DutchCrafters Learning Center. For 54" and 60" size tables, call for quotes. Shown in Brown Maple with Black Painted Skirt & Base with Asbury FC 7992 on Top.